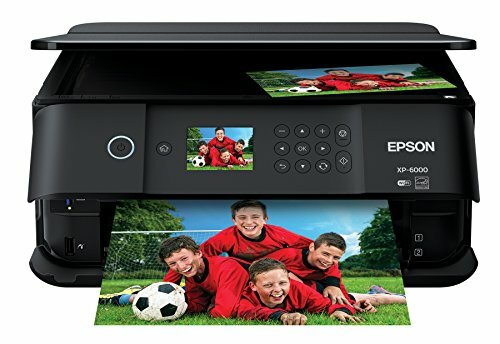 The ultra powerful, ultra slim Expression Premium XP-6000 wireless Small-in-One printer delivers superior photo quality and fast print speeds. Print 4" x 6" photos in as fast as 15 seconds (1). With affordable, individual 5-color Claria Premium Inks, you can print stunning borderless photos up to 8" x 10", plus sharp text. Save time with fast speeds — up to 15.8 ISO ppm (black) and 11.3 ISO ppm (color)† — and auto 2-sided printing. Built-in USB and memory card slots (2), a 2.4" color LCD and dedicated photo/DVD trays offer additional convenience. Plus, you can easily print from your iPad, iPhone, Android tablet or smartphone (3) — with or without a router. 1. Color photo in Draft Mode on Premium Photo Paper Glossy measured from start of paper feed. Actual print times will vary based on factors including system configuration, software, and page complexity. For more information, visit our official site. 2. Adapter may be required. Save time - print 4" x 6" photos in as fast as 15 seconds (1). Superior photo quality with 5-color inks - print stunning photos up to 8" x 10", plus sharp text for eye-catching documents. Convenient, hassle free features - auto 2-sided printing, built-in USB and memory card slots (2), and 2.4" color LCD and touch panel. Versatile printing - dedicated photo and DVD trays.